I'm David Rosenthal from the LOCKSS Program at the Stanford University Libraries, which last October celebrated its 15th birthday. The demands of LOCKSS and CLOCKSS mean that I won't be able to do a lot more work on the big picture of preservation in the near future. So it is time for a summing-up, trying to organize the various areas I've been looking at into a coherent view of the big picture. Somewhat less than half sounds as though we have made good progress. Unfortunately, there are a number of reasons why this simplistic assessment is wildly optimistic. Each unit of the content we are currently not preserving will be more expensive than a similar unit of the content we currently are preserving. I don't know anyone who thinks digital preservation is likely to receive a vast increase in funding; we'll be lucky to maintain the current level. So if we continue to use our current techniques the long-term rate of content loss to future readers from failure to collect will be at least 50%. This will dwarf all other causes of loss. If we are going to preserve the other more than half, we need a radical re-think of the way we currently work. Even ignoring the issues above, we need to more than halve the cost per unit of content. I'm on the advisory board of the EU's "4C" project, which aims to pull together the results of the wide range of research into the costs of digital curation and preservation into a usable form. My rule of thumb, based on my reading of the research, is that in the past ingest has taken about one-half, preservation about one-third, and access about one-sixth of the total cost. What are the prospects for costs in each of these areas going forward? How much more than halving the cost do we need? The major cost of the preservation phase is storage. The cost of storing the collected content for the long term has not been a significant concern for digital preservation. Kryder's Law, the exponential increase in bit density of magnetic media such as disks and tape, stayed in force for three decades and resulted in the cost per byte of storing data halving roughly every two years. Thus, if you could afford to store a collection for the next few years you could afford to store it forever, assuming Kryder's Law continued in force for a fourth decade. The slowing started in 2010, before the floods hit Thailand. Disk storage costs are now, two and a half years after the floods, more than 7 times higher than they would have been had Kryder's Law continued at its usual pace from 2010, as shown by the green line. 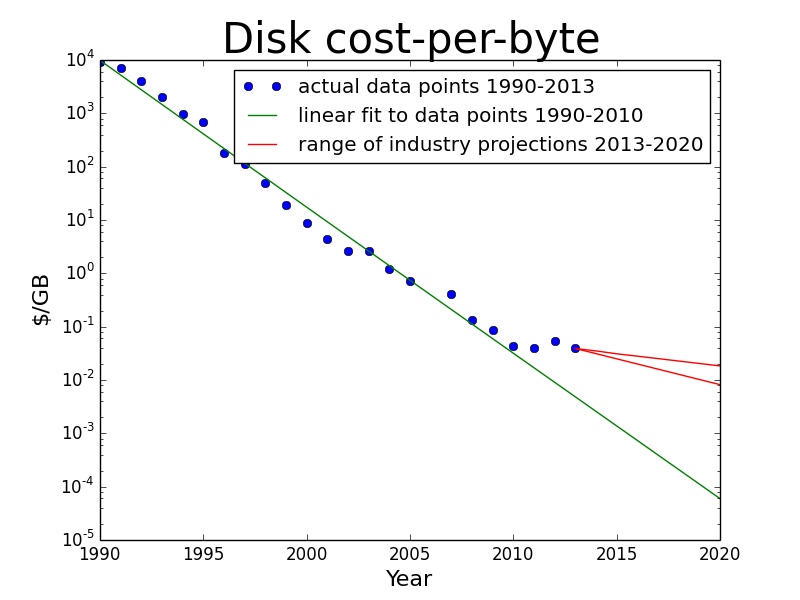 If the industry projections pan out, as shown by the red lines, by 2020 disk costs will be between 130 and 300 times higher than they would have been had Kryder's Law continued. It can be monetized, as with Google's Gmail service, which funds storing your e-mail without charging you by selling ads alongside it. It can be rented, as with Amazon's S3 and Glacier services, for a monthly payment per Terabyte. It can be endowed, deposited together with a capital sum thought to be enough, with the interest it earns, to pay for storage "forever". Archived content is rarely accessed by humans, so monetization is unlikely to be an effective sustainability strategy. In effect, a commitment to rent storage for a collection for the long term is equivalent to endowing it with the Net Present Value (NPV) of the stream of future rent payments. I started blogging about endowing data in 2007. 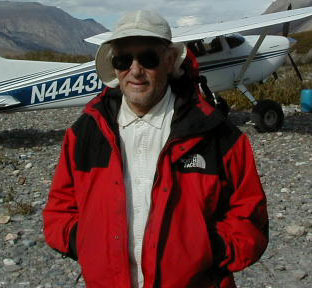 In 2010 Serge Goldstein of Princeton described their endowed data service, based on his analysis that if they charged double the initial cost they could store data forever. I was skeptical, not least because what Princeton actually charged was $3K/TB. Using their cost model, this meant either that they were paying $1.5K/TB for disk at a time when Fry's was selling disks for $50/TB, or that they were skeptical too. Earlier in 2010 I started predicting, for interconnected technological and business reasons, that Kryder's Law would slow down. I expressed skepticism about Princeton's model in a talk at the 2011 Personal Digital Archiving conference, and started work building an economic model of long-term storage. A month before the Thai floods I presented initial results at the Library of Congress. 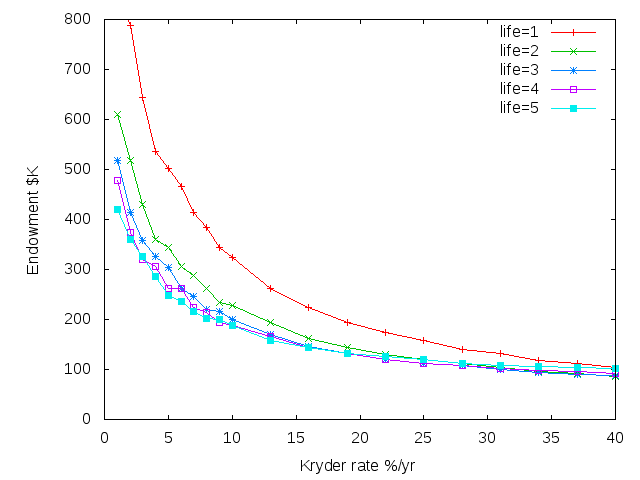 A month after the floods I was able to model the effect of price spikes, and demonstrate that the endowment needed for a data collection depended on the Kryder rate in a worrying way. At the Kryder rates we were used to, with cost per byte dropping rapidly, the endowment needed was small and not very sensitive to the exact rate. As the Kryder rate decreased, the endowment needed rose rapidly and became very sensitive to the exact rate. Since the floods, the difficulty and cost of the next generation of disk technology and the consolidation of the disk drive industry have combined to make it clear that future Kryder rates will be much lower than they were in the past. Thus storage costs will be much higher than they were expected to be, and much less predictable. According to IHS iSuppli, the bit density on the platters of disk drives will grow no more than 20%/year for the next 5 years. Here's a graph that projects these three numbers out for the next 10 years. The red line is Kryder's Law, at IHS iSuppli's 20%/yr. 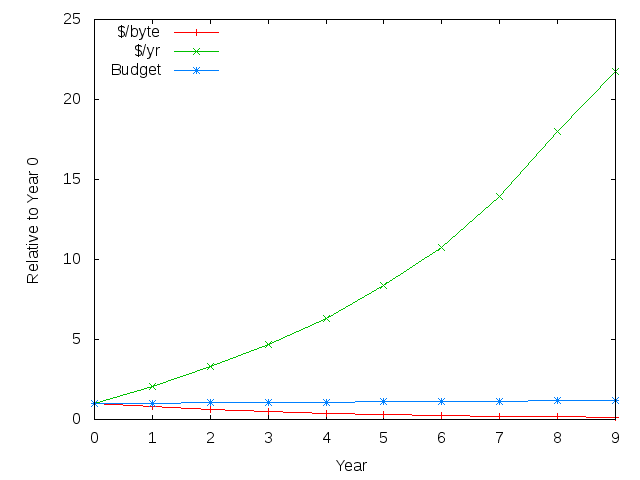 The blue line is the IT budget, at computereconomics.com's 2%/yr. The green line is the annual cost of storing the data accumulated since year 0 at the 60% growth rate projected by IDC, all relative to the value in the first year. 10 years from now, storing all the accumulated data would cost over 20 times as much as it does this year. If storage is 5% of your IT budget this year, in 10 years it will be more than 100% of your budget. On these numbers, if storage cost as a proportion of your budget is not to increase, your collections cannot grow at more than 22%/yr. Recent industry analysts' projections of the Kryder rate have proved to be consistently optimistic. My industry contacts have recently suggested that 12% may be the best we can expect. My guess is that if your collection grows more than 10%/yr storage cost as a proportion of the total budget will increase. When resources are very scarce, there's a great tendency to centralize, to standardize, to eliminate redundancy in the name of cost effectiveness. This can be very dangerous; it can produce systems that are very brittle and vulnerable, and that are subject to catastrophic failure. But monoculture is not the only problem. As I pointed out at the Preservation at Scale workshop, the economies of scale are often misleading. 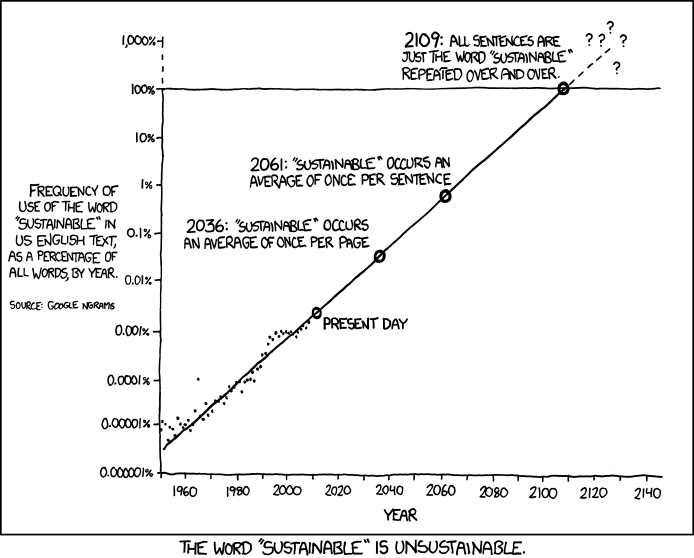 Typically they are an S-curve, and the steep part of the curve is at a fairly moderate scale. And the bulk of the economies end up with commercial suppliers operating well above that scale rather than with their customers. These vendors have large marketing budgets with which to mislead about the economies. Thus "the cloud" is not an answer to reducing storage costs for long-term preservation. The actions of the Harper government in Canada demonstrate clearly why redundancy and diversity in storage is essential, not just at the technological but also at the organizational level. Content is at considerable risk if all its copies are under the control of a single institution, particularly these days a government vulnerable to capture by a radical ideology. I'm very worried that as we build up very visible instances of digital cultural heritage that these collections are going to become subject [to] attack in the same way the national libraries, museums, ... have been subject to deliberate attack and destruction throughout history. Imagine the impact of having a major repository ... raided and having a Wikileaks type of dump of all of the embargoed collections in it. ... Or imagine the deliberate and systematic modification or corruption of materials. Edward Snowden's revelations have shown the attack capabilities that nation-state actors had a few years ago. How sure are you that no nation-state actor is a threat to your collections? A few years hence, many of these capabilities will be available in the exploit market for all to use. Right now, advanced persistent threat technology only somewhat less effective than that which recently compromised Stanford's network is available in point-and click form. Protecting against these very credible threats will increase storage costs further. Every few months there is another press release announcing that some new, quasi-immortal medium such as stone DVDs has solved the problem of long-term storage. But the problem stays resolutely unsolved. Why is this? Very long-lived media are inherently more expensive, and are a niche market, so they lack economies of scale. Seagate could easily make disks with archival life, but they did a study of the market for them, and discovered that no-one would pay the relatively small additional cost. Long media life does not imply that the media are more reliable, only that their reliability decreases with time more slowly. As we shall see, current media are many orders of magnitude too unreliable for the task ahead. It has always been assumed that the vast majority of archival content is rarely accessed. Research at UC Santa Cruz showed that the majority of accesses to archived data are for indexing and integrity checks. This is supported by the relatively small proportion access forms of total costs in the preservation cost studies. But this is a backwards-looking assessment. Increasingly, as collections grow and data-mining tools become widely available, scholars want not to read individual documents, but to ask questions of the collection as a whole. Providing the compute power and I/O bandwidth to permit data-mining of collections is much more expensive than simply providing occasional sparse read access. Some idea of the increase in cost can be gained by comparing Amazon's S3, designed for data-mining type access patterns, with Amazon's Glacier, designed for traditional archival access. S3 is currently at least 5.5 times as expensive. An example of this problem is the Library of Congress' collection of the Twitter feed. Although the Library can afford the not insignificant costs of ingesting the full feed, with some help from outside companies, the most they can afford to do with it is to make two tape copies. They couldn't afford to satisfy any of the 400 requests from scholars for access to this collection that they had accumulated by this time last year. The estimate of half is optimistic. The rest of the content will be much more expensive to ingest. The costs of storing even the content we're currently preserving have been underestimated. The access that scholars will require to future digital collections will be much more expensive than that they required in the past. Thus, we need a radical re-think of our entire set of digital preservation techniques with the aim of vastly reducing their cost. We probably need a cost reduction of at least 4 and maybe 10 times. I certainly don't know how to do this. Let's brainstorm some ideas that might help toward this goal. How important is the metadata to the task of preservation? Generating metadata because its possible, or because it looks good in voluminous reports, is all too common. Format metadata is often considered essential to preservation, but if format obsolescence isn't happening , or if it turns out that emulation rather than format migration is the preferred solution, it is a waste of resources, and if validating the formats of incoming content using error-prone tools is used to reject allegedly non-conforming content it is counter-productive. Access via bibliographic (as opposed to full-text) search via, for example, OpenURL resolvers. Bibliographic search, preservation tracking and bragging about how many articles and books your system preserves are all important, but whether they justify the considerable cost involved is open to question. Perfect preservation is a myth, as I have been saying for at least 7 years using "A Petabyte for a Century" as a theme. Current storage technologies are about a million times too unreliable to keep a Petabyte intact for a century; stuff is going to get lost. Adding each successive nine of reliability gets exponentially more expensive. How many nines do we really need? Is losing a small proportion of a large dataset really a problem? The canonical example of this is the Internet Archive's web collection. Ingest by crawling the Web is a lossy process. Their storage system loses a tiny fraction of its content every year. Access via the Wayback Machine is not completely reliable. Yet for US users archive.org is currently the 153rd most visited site, whereas loc.gov is the 1231st. For UK users archive.org is currently the 137th most visited site, whereas bl.uk is the 2752th. Why is this? Because the collection was always a series of samples of the Web, the losses merely add a small amount of random noise to the samples. But the samples are so huge that this noise is insignificant. This isn't something about the Internet Archive, it is something about very large collections. In the real world they always have noise; questions asked of them are always statistical in nature. The benefit of doubling the size of the sample vastly outweighs the cost of a small amount of added noise. In this case more is better. The Blue Ribbon Task Force on Sustainable Digital Preservation and Access pointed out that the only real justification for preservation is to provide access. In most cases so far the cost of an access to an individual document has been small enough that archives have not charged the reader. But access to individual documents is not the way future scholars will want to access the collections. Either transferring a copy, typically by shipping a NAS box, or providing data-mining infrastructure at the archive is so expensive that scholars must be charged for access. This in itself has costs, since access must be controlled and accounting undertaken. Further, data-mining infrastructure at the archive must have enough performance for the peak demand but will likely be lightly used most of the time, increasing the cost for individual scholars. The real problem here is that scholars are used to having free access to library collections, But what they increasingly want to do with the collections is expensive. A charging mechanism is needed to pay for the infrastructure and, because the scholar's access is spiky, the could provides both suitable infrastructure and a charging mechanism. For smaller collections, Amazon provides Free Public Datasets, Amazon stores the, charging scholars accessing them for the computation rather than charging the owner of the data for storage. Even for large and non-public collections it may be possible to use Amazon. Suppose that in addition to keeping the two archive copies of the Twitter feed on tape, the Library kept one copy in S3's Reduced Redundancy Storage simply to enable researchers to access it. Right now it would be costing $7692/mo. Each month this would increase by $319. So a year would cost $115,272. Scholars wanting to access the collection would have to pay for their own computing resources at Amazon, and the per-request charges; because the data transfers would be internal to Amazon there would not be bandwidth charges. The storage charges could be borne by the library or charged back to the researchers. If they were charged back, the 400 outstanding requests would each need to pay about $300 for a year's access to the collection, not an unreasonable charge. If this idea turned out to be a failure it could be terminated with no further cost, the collection would still be safe on tape. In the short term, using cloud storage for an access copy of large, popular collections may be a cost-effective approach. Recently Twitter offered a limited number of scholars access to its infrastructure to data-mine from the feed, but this doesn't really change the argument. There are potential storage technologies that combine computation and storage in a cost-effective way. Colleagues at UC Santa Cruz and I proposed one such architecture, which we called DAWN (Durable Array of Wimpy Nodes) in 2011. Architectures of this kind might significantly reduce the cost of providing scholars with data-mining access to the collections. The evolution of storage media is pointing in this direction. But there are very considerable business model difficulties in the way of commercializing such technologies. Any way of making preservation cheaper can be spun as "doing worse preservation". Jeff Rothenberg's Future Perfect 2012 keynote is an excellent example of this spin in action. We live in a marketplace of competing preservation solutions. A very significant part of the cost of both not-for-profit systems such as CLOCKSS or Portico, and commercial products such as Preservica is the cost of marketing and sales. For example, TRAC certification is a marketing check-off item. The cost of the process CLOCKSS is currently undergoing to obtain this check-off item will be well in excess of 10% of its annual budget. Making the tradeoff of preserving more stuff using worse preservation would need a mutual non-aggression marketing pact. Unfortunately, the pact would be unstable. The first product to defect and sell itself as "better preservation than those other inferior systems" would win. Thus private interests work against the public interest in preserving more content. Reading individual documents one-at-a-time is unlikely to be the access mode future scholars require. At the scale required against the threats they address, bit-rot and format obsolescence, the effectiveness of current techniques is limited. Against other credible threats, such as external attack and insider abuse, the effectiveness of current techniques is doubtful. Current techniques are so expensive that by far the major cause of future scholars inability to access content will be that the content was not collected in the first place. We need a complete re-think of the techniques for digital preservation that accepts a much higher risk of loss to preserved content and in return allows us to preserve much more content. Summary: In archive.org, robots outnumber humans 10:1 in terms of sessions, 5:4 in terms of raw HTTP accesses (b/c of images), and 4:1 in terms of megabytes transferred. 95% of robot accesses are page scraping the calendar interface (i.e., HTML TimeMaps), and 33% of human accesses hit just a single memento. Summary: Covers many things, but table 3 is the most important: for humans, if archive.org gives a 200 (i.e., page is archived) then there is a 64% chance the page is 404 on the live web; if archive.org gives a 404 (i.e., page not archived), then there is a 75% chance the page is 404 on the live web. We had begun this line of study hoping to develop something that looked for patterns in the web archive accesses with the hope of correlating them with current events (or the other way around). For example, on the 1 year anniversary of X there would be sessions in IA about X. We couldn't find anything like that; if it's there it's well hidden. Basically, humans hit archive.org for individual 404 pages and *not* historical sessions. The Lancet Global Health has a piece detailing the Harper government's attacks on science. More on the Harper government's war on science here. Another interesting piece of research from Old Dominion University. Lulwah M. Alkwai studied how well Arabic websites are preserved, and yet again concluded that about half of their sample of URIs was not archived (138968/300646 to be precise, or 46%). While I'm here, Dave at 24%Majority summarizes the entire 4 year record of the Harper administration in 2011-2015 Harper Government Wrap-up.